Clothing & Jewelry, picked just for you and delivered every month. Three Boxes to Choose from based on your needs, we have something for everyBODY. All available in Size Small - 3XL. No commitment - switch product, skip or cancel at anytime. 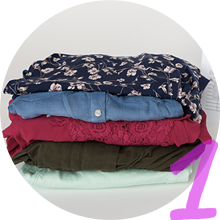 Receive 5 pieces of clothing picked just for you by your stylist based on your profile. 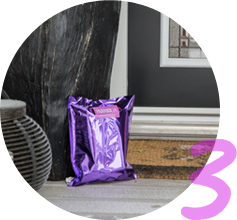 Try them on at home, put returns in the resealable bag with prepaid postage and drop it in the mail. Pay only for what you keep. Items are individually priced ($24-$79/each) and your monthly subscription fee is credited to your bill if you keep more than one item. Keep all for 25% Off! Receive one handmade piece of jewelry or accessory by a Canadian Designer. Support amazing local entrepreneurs while expanding your accessory collection at an affordable price! Receive one outfit hand-picked for you by your stylist based on your profile. Examples of an 'outfit' may include a top + bottom, dress, or a top + cardigan. You may also receive a piece of jewellery to tie the outfit together. Three Boxes to suit your needs, closet, and budget. Its time to get styled! Complete your style profile and tell us all about yourself! Make sure to let your stylist know all about your preferences – the more we know, the better we can style you! Every box is available in Size Small - 3XL. No commitments - switch product, skip or cancel at anytime. Its time to get styled! Complete your style profile and tell us all about yourself. Make sure to let your stylist know all about your preferences – the more we know, the better we can style you! Your Frock Box will ship within 10 business days upon sign up. We can’t wait to style you! Don't forget to snap of photo of your Frocks and share on Facebook, Instagram or Twitter for a chance to win a great prize every month! 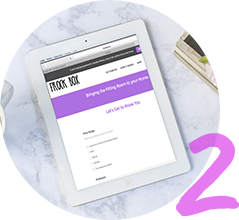 Frock Box Gold includes 2-3 handpicked items completing an outfit for $49.95/month + $9.95 Shipping. Gold boxes are outfit based and designed for someone who could use a hand putting pieces together. Follow the prompts to subscribe, fill out your style profile and wait for your stylist to surprise you with an outfit delivered to your door. Gold boxes include an outfit tying in your style preferences, current trends and season. Sizes range from S-3XL. We want to make sure we have something for everyBODY. No deadline! You are billed monthly on your sign up date. Your box will ship within 10 days of sign up! We source from multiple countries and have a variety of goods – some locally made (St. Albert, AB) and others sourced from US/China. Ensuring good quality, affordable products is very important to us. We also strive to work with local “Momprenuers” to help support the Stay At Home Mom dream. We get it! Your sizes and preferences change so please email [email protected] to update your style profile. Boxes are shipped through Canada Post within 10 days of sign up or rebill date. We do our best to ship out as soon as possible! Yes. Send us an email for your tracking number. Login to your account and update your address. Make sure to update your address one week before your rebill date. We currently only ship to Canadian residents. Jewel shipping cost is $3/month. Gold shipping cost is $9.95/month. Favourites shipping cost is free. *Nunavut customers will be charged an additional shipping charge dependent on address/location.